Provide comfort for the family of Leon Jacobs with a meaningful gesture of sympathy. 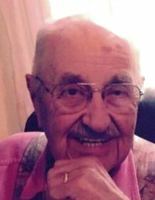 Leon D. “Jake” Jacobs, 90, a resident of Pleasant Valley Road in Bennington died Tuesday April 2, 2019 at his residence following a brief illness. He was born in Bennington, VT February 26, 1929. He was the son of the late Leon I. Jacobs and Gwendolyn (Charlesworth) Jacobs. Jake received his education in Bennington and was a 1947 graduate of Bennington High School where he starred in football, basketball and baseball. Jake married the former Muriel D. Bass on September 21, 1951. He later married the former Eloise Main on December 10, 2001. In 1967 Jake purchased Bennington Amusement which he owned and operated until his retirement. An avid hunter, trapper and fisherman. Jake enjoyed turkey and deer hunting. He also along with his sons, trapped muskrat, mink and beaver. He was a life member of NRA. He loved his dogs, gardening and bowling. Survivors include his wife, Eloise Jacobs of Bennington. His sons, Kevin Jacobs and his wife Ruth of Effort, PA and Scott Jacobs of Bennington. His step children, Sharon Rancourt Watson of Bennington, Mark Rancourt of Bennington, Jennifer Schilling of Washougal, Washington and Kristen Rancourt-Miner of Nottingham, NH. Ten grandchildren, Shannon, Morgan, Luis, Sarah, Larissa, Iraj, Logan, Thea, Anna and Nicholas along with nine great grandchildren and several nieces, nephews and cousins. He was pre-deceased by a son, Wayne Jacobs and a sister Barbara Murray. A celebration of Jakes life will be held at the Mount Anthony Country Club on Sunday April 7, from 1:00 to 4;00 p.m. The family would like to invite all family and friends to celebrate Jake’s life. To send flowers in memory of Leon D. "Jake" Jacobs, please visit our Heartfelt Sympathies Store. Provide comfort for the family of Leon D. "Jake" Jacobs by sending flowers. Dear Scott and Family , So sorry to hear that your Dad passed. He was a really cool guy who could talk to anyone about deer or especially Turkey hunting. He loved life and really enjoyed talking story about almost anything . I'm so glad that I had a chance to know "Jake" for many years. In my book , he was one of the most unforgettable characters in my life. RIP JAKE !! !